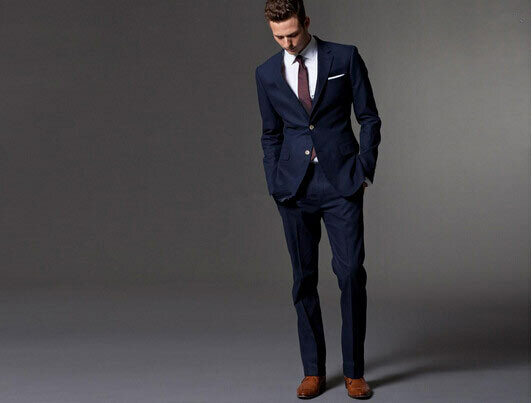 There is no better look for a man apart from Suit. And if that is Navy blue, it goes next level. What is so exciting about the Navy Blue suit? It's dark, but it's not black. It's a stable color, and can be used either as a neutral or as an accent. It also makes for a great base color spelling elegance and class. Stick to 100% virgin wool fabrics, as they work well with Navy. Excessive matte finishes or very smooth suits can actually make a navy suit look too shiny and that would take away from the depth of its colour. One can accessorize this look with simple black cuffs to make the attire look classy. Choose Plain White as contrast for a very formal look. When in doubt, you can always pair a Navy suit with a plain white stiff shirt for a very formal look, but use it for specific occasions. A lighter coloured tie, can add life to the entire ensemble. Play the contrasting game, with a lighter blue shirt. This is an ultra-conservative look, and perfect for the board room power play. Add some relief to it with a solid contrasting tie in red or maroon. If you are looking for a more casual look, then wear a pin-striped shirt under it, and let go of the tie. This look is perfect for a business casual dinner. One can also accessorize it with smart cuffs or quirky brooch. Day-wear suits, especially for lunches, and weddings are perfectly paired with a simple light pastel coloured shirt, and a tie in neutral tones. This adds elegance to the entire outfit, while keeping it less formal. If you want to break from tradition, and keep the look more edgy, opt for a grey shirt under your blue suit. The result is a cool tone of grey making a soft contrast to the deep solid colour of blue. It's fashionable and dapper and should be paired with bold coloured accessories like a red pocket square.